Join us for the first in our newest series, Poetry Readings at the space, featuring Chris LaTray, Melissa Stephenson, Gillian Kessler, and Mark Gibbons. Celebrate National Poetry Month with these tall tales and local legends! Join Susan Morgan, Ryan Boswell, Lucas Yatch, and Jordan Smith for an intimate night of songs and storytelling at Wave & Circuit, hosted by Anthony Lamarr Brown. LUCAS YATCH...Originally from Bigfork, Montana, is an architectural designer, musician, and motorcycle enthusiast. As an acoustic singer songwriter, Lucas writes songs deeply rooted in the northwest of the United States, taking a modern day approach on traditional folk and country music. JORDAN SMITH is a 6th generation Bitterrooter and a long time player in the Missoula music scene. Playing all over the Rocky Mountain west with the bands Shakewell and Three Eared Dog, he has developed a style that ranges from blues/country to pop/funk. There is a suggested donation of $5 at the door. Check out the Facebook page for more updates! We’ll be rounding out a busy weekend Sunday night with a rare appearance from Worst Feelings, featuring support from singer-songwriter Jacob Milstein. Worst Feelings is a supergroup currently boasting Jesse Hadden, Nick Ryan, Lukas Phelan, Nate Biehl, Caroline Keys, and Jaimie Stevenson in its lineup. What better way to recuperate from the previous two nights than with an intimate evening of delicate pop and groovy country music? On the fence? I’d suggest you preview Worst Feelings’ music here. Doors are at 7 and music will start at 7:30. Join us for an intimate night of experimental electronic music and visuals in an intimate setting. The Cool Beats Club is an all-ages, open community of musicians, existing for the sole purpose of fostering genuine relationships between artists. Born out of a need for more electronic music focused, intentional listening spaces, The Cool Beats Club wants to create an environment where people of any and all skill levels can come and learn about electronic music, gear and everything between. Join us for their inaugural showcase, featuring locals SCENE, Mike Stolin, Katana Boy, SOPHISTICAL and Luxury. Doors are at 7 and there is a suggested donation at the door. Check it out on Facebook! Join Caroline the Character (Irick), Jackson Holte, Anthony Lamarr Brown w/Si Smith, and Meggie McDonald for an intimate night of songs and storytelling at Wave & Circuit, hosted by Anthony Lamarr Brown. The Songwriter’s Circle follows a unique format where each of the artists are asked to play a single song, one after the other. This gives way to an organic show flow and improvisational exchanges between the artists. CAROLINE THE CHARACTER (IRICK) is a singer songwritier based out of Denver, Colorado. She has had a love for music and creativity since she was a child. Her music comes from a place of confusion and a yearning to understand the world around her. JACKSON HOLTE is a Missoulian guitar player and songwriter who has played with Newlyweds, Gooseberries, and now fronts his own band, Jackson Holte & the Highway Patrol. His solo set expands on the Americana sound that has made the Highway Patrol a barroom favorite in Western Montana and delves into his roots in folk songwriting and blues guitar playing. Holte’s dexterous picking breathes life into sturdy songs, bounding across genres to complement a mature voice that is alternately insightful or irreverent. MEGGIE MCDONALD is a singer/songwriter who was born and raised in the mountains of Montana. Growing up in a musical family, music became her life from a very young age. She started performing when she was 6 years old and now splits her time between Montana and Oklahoma collaborating on recording projects and performing at various venues and festivals. Doors are at 6:30 and there is a $5 suggested donation. Check it out on Facebook! The Bob Plus One series returns for its fourth installment, featuring local musician Wailin’ Aaron Jennings. Jennings is a country-Americana musician who has toured extensively and played with numerous groups in Missoula, and is perhaps best known for his unique blend of storytelling, yodeling and guitar stylings. Doors are at 6:30 and there is a suggested donation of $10 at the door. Check it out on Facebook! Night Blooming Jasmine will be gracing us with a night of worldly jazz music inspired by the likes of the great Django Reinhardt and Stephane Grappelli. The five-piece has played all over town and toured, and has released their music online. Join us for a cozy night in for stories and song! "No Excuses" Album Release with Travis Yost & Tom Catmull! Join us for the release of the new Love is a Dog from Nebraska album, “No Excuses”. Tom Catmull to open! $10 suggested donation! Come join us for the 2nd wave in the Bob Plus One series on Dec 13th, where special guest Travis Yost is joined by Bob Wire for another wild night of music at W&C. Doors 6:30pm, music at 7pm, suggested donation $10. We supply canned beverages, you supply the fun! The premiere of "Pop!" -- a new experimental, dance film by Noelle Huser. Following the screening will be a collaborative performance piece by No Dancing and music from MSLA's girliest dance punks, BOY FEUD. The Songwriters Circle is a night of original music, storytelling, improvisation, laughs, cries, and everything in between! Four invited songwriters will rotate one song at a time, sharing with the audience what inspired them to write their songs. They can also invite another songwriters to join them during their turn. Join songwriters...Anthony Lamarr Brown (acc. by Milan House), Rebecca Kelley, Jordan Smith, and Meggie McDonald for an intimate night of songs and storytelling at Wave and Circuit in Missoula!! A neighborhood event, to Get Out the Vote on Nov 6, and support Jon Tester, Oct 12, 7pm at Wave and Circuit, 829 S. Higgins (next to Record Heaven, across from Hellgate High). Come on out, help us get out the Nov 6 VOTE, and hear some great music by Bob Wire, and Mark Chase! Suggested donation $5-$10, complimentary drinks. PLEASE NOTE: We’re cancelling this earlier planned meeting at Wave & Circuit so as not to distract or conflict from other meetings on this topic occurring this same evening. Wave & Circuit Presents! Basses Covered ...plays rock, folk, wop, country and jazz music! Marlene Hutchins picked up the guitar at age 10, driven to learn popular folk songs and transistor radio hits. A huge Beatle fan, she’d play and sing harmony with her sister and cousins to every song they could learn, as fast as they could learn them. Auditions for talent shows followed, and soon she convinced the owner of Cafe Galleria, an Italian restaurant below the Joni-Mitchell-made-famous Laurel Canyon Country Store, to hire her to perform a solo series for dinner guests. In 1989, Marlene moved to Montana and found herself in the circle of huge, warm and welcoming music family, which led her to the musicians (Marlene, Carla Green, and Eric Pfeiffer) that form the band Basses Covered, a trio she embraces. Basses Covered has been blazing their way through Missoula, from festivals to tap rooms to markets to back yard patios. We play well-known and little-known songs from our favorite music libraries of artists that include Ray Charles, the original Moody Blues, Everly Brothers, Moonglows and our own tunes. Veteran musicians Carla (bass, guitar), Eric (rhythm and lead guitar) and Marlene (guitar, bass) form this harmonious trio that makes you wonder where all that percussion is coming from without a drummer. We just might get you tapping your feet or swing-dancing with a partner. It's been known to happen. Wave & Circuit Presents! welcomes Ron Meissner, Bill Haffey, Micki Singer and Carla Green who will be playing some of their favorite jazz tunes in an intentional listening environment. Wave & Circuit is a small, cozy, high fidelity, intimate concert venue at 829 S. Higgins in Missoula, across from Hellgate High, in between the Game Shop and Record Heaven on Higgins. We will have guest appearances by Cousin Marlene and Rod Blackman! Doors at 7pm, Music at 7:30pm. $5 cover/person. Wave & Circuit Presents! 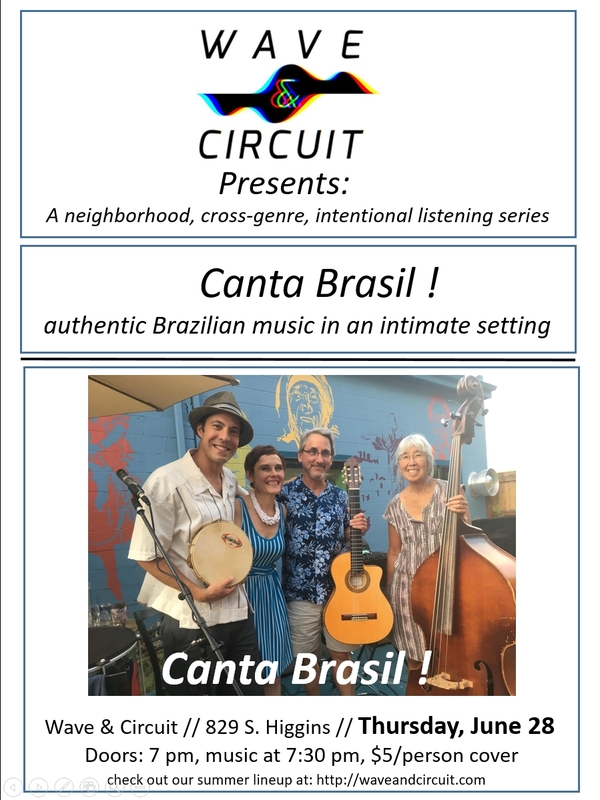 Canta Brasil -- a group of top Missoula musicians and Brazilian music aficionados performs samba, bossa nova, choro, forró and baião. $5/person cover charge. Doors open 7 pm, with music at 7:30pm. On the Hip Strip, at 829 S. Higgins, Missoula 59801. Canta Brasil loves to perform Brazilian music. The group varies in size from trio to septet, featuring guitar, bass, vocals, a variety of Brazilian percussion instruments, and is often supplemented by saxophone, trombone or trumpet. If you love fun and dancing to the intoxicating rhythms of samba, bossa nova, forró , baião or listening to beautiful melodies of choro, this is definitely an event not to be missed." crosstalk is comprised of Bill Kautz, leader/trumpet, Christopher Gray, guitar, Steve Kalling, bass, Emily Silks, drums and Naomi Siegel, trombone and keyboard. The aim of crosstalk is to consistently create a sound that is unique and original, unlike any other project currently on the streets. We aim to liberate ourselves as players and simultaneously come together in communion by creating interwoven strands of dialogue from multiple perspectives, intensities and styles. Our ideas and commentary as sound artists is about the now. Each of us believes strongly in the healing and spiritual force of music to reach spaces within ourselves that cannot be reached through any other medium. We hope to go there with you and hope you can join us on June 14th at Wave and Circuit. Explore musical improvisation with Naomi Siegel, acclaimed musician, composer, and educator. Develop improvisation skills for any musical context in a nurturing environment. Using creative limitations and techniques to build listening awareness, participants will walk away from this workshop with an increased connection to making music and new ways to practice individually and in ensembles. No prior improvisation experience necessary. $40 to attend. Join local artists, thinkers and musicians in a night of conversation about your current creative projects.